Maple Ice Mints, in their faux-woodgrain metal tins. Made by Big Sky Brands, the same people behind the Sunkist mints I reviewed earlier, these curious new Maple Ice Mints present a strange flavour combination I’d never thought of before: mint and maple. On their own, I like both flavours, but what happens when they collide in a single candy? The Look: It’s got tourist bait written all over it. Metal tin with a faux woodgrain look, a red maple leaf and vintage-style lettering. Even though the tin is packaged in plastic shrink wrap, you can still easily smell the maple before opening the tin. The Taste: A nice sweet maple flavour, followed by an almost medicinal twang that gets in the way of the maple. I imagine that’s an attempt at making it a breath mint, but, to be frank, they really should have just left well enough alone. It would have been a great little maple candy without the nasty “mint” flavour. 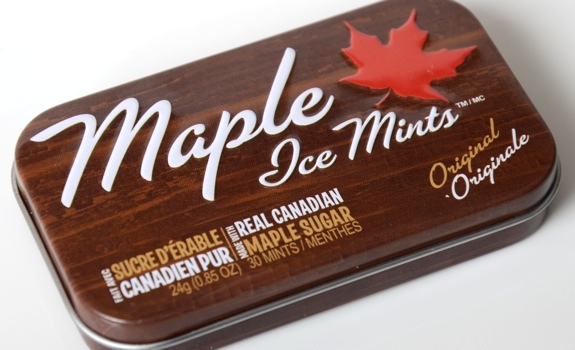 Each Maple Ice Mint is stamped with a maple leaf. Quelle patriotisme! Cost: $1.99 for a 24 gram (0.85 oz.) 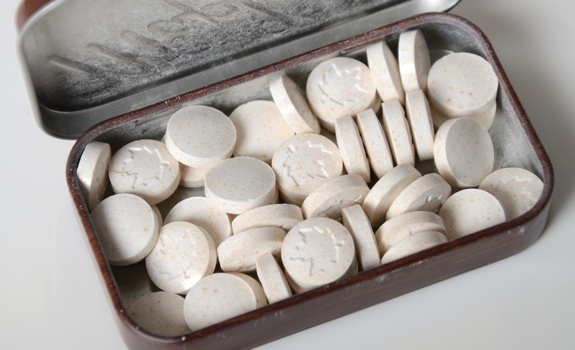 tin of 30 mints at London Drugs in Calgary. Availability: The only place I’ve seen them so far is at my local London Drugs. Nutrition? : The packaging doesn’t have any nutritional info on it. Instead, there’s a number (1-888-624-4759) listed that you can call for nutritional info. The verdict: If it were left as a maple-only candy without the mint, it could have been delicious. Instead, we’re left with a practical reminder that some flavours just aren’t meant to be paired together.